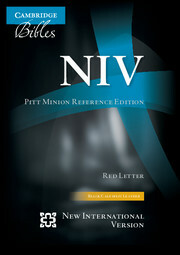 This Bible presents the ever-popular New International Version using the NIV text, as updated in 2011. It is in the classic Cambridge Pitt Minion layout, a clever combination of readable text and compact form. The text is set in Lexicon No. 1, a modern digital font that is efficient at fitting a lot of words into a small space – a significant advantage for a Bible that needs to be compact enough to carry easily. It is arranged in paragraph format, and the words of Christ are printed in red. The text is supported by cross-references and a concordance. The Bibles are printed on India paper and bound with a marker and presentation page in a choice of calf split or goatskin leather.